Drew this one up some time ago and thought i'd post it up. It's basically Mark's layout for Keeley 4-knob style compressor with slight tweaks and more notably, an addition of mix/blend/ratio knob. As some of you already know, the basic CA3080 compressors like Ross, MXR and derivatives reverse the signal polarity and thus, the simple blend circuit additions won't work with it. 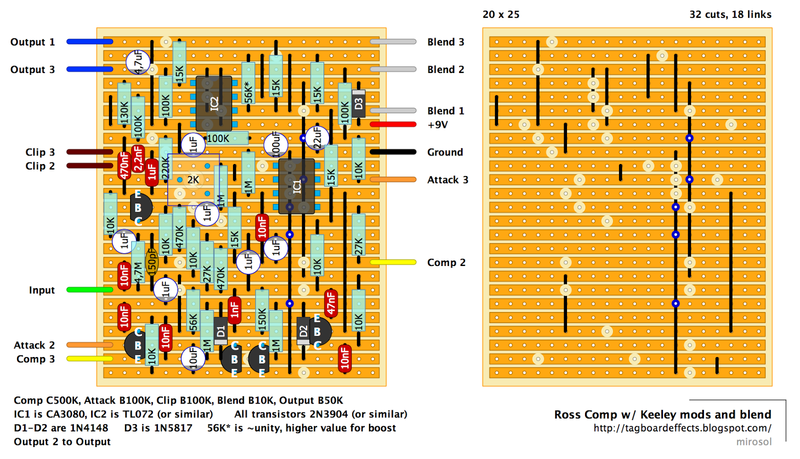 So here's the Ross compressor with tons of usable mods on it. I've built a number of these already, so consider it verified. 2017/05/08 - One cap was reversed on the layout. Now fixed, but i had to redraw this completely due to lost source files. Anyway. Here's the "V2". Do you know if this is similar to the BYOC 5 knob? Yes i do. No it's not. BYOC's take on parallel comp is closer to Ibanez CPL/CP10/CP5 compressor with added tone and blend controls than any of the ones listed here. Completely different VCA and thus, completely different circuit. Nice! Do the transistors need to be matched? No, they do not. And any NPN will work just fine. going on my list right after the engineers thumb . I love compressors ! Sorry but where's the COMP 1? and thank you ! Built, thank you for that post it works very well. I'm very happy of the mods. Thanks again. what does the trimmer do? Sorry for the newb question, but I'm super new to pedal building (and electronics, generally) and I have a question about the layout. What's the blue square just left of center? There are a few cuts, with a 2K mark and three blue dots. Sorry, just not familiar with this particular set of symbols. Maybe it hit me eventually... 2K trimpot? Correct. It is a 2K trimpot. can I use this cOmpressor on my bass? . Yes. As you can use any compressor that is based on dyna or ross. Finally getting around to building this. Is the 1u cap just below the 2k trimmer drawn backwards? Should the + side be connected to the Collector and the (-) side to ground? Did the layout get updated for this cap orientation? I'm having a hard time debugging this one, it's my first compressor. I tried it both ways, but nothing. Does anyone have any voltages I can compare to? I tried tracing it but so far this one is pretty complicated. Hi, doesnt look like the layout has been uodated, the 1u cap just below the trimmer needs to be flipped. Do you have an audio probe handy for troubleshooting? Thanks, yes the layout hasn't been updated, the cap needs to be flipped. I found my problem, I had a small solder bridge. Working great now! Thanks for the response. No, the cap isn't fixed. It's a long story, but last summer i lost all of my data due to currupted disk controller. Home and mirrored backup drives were both rendered unreadable. So i do not hold the source files anymore and to fix any of my layouts would mean to redraw them completely. I might do some of those at one point, but this hasn't been a high priority. It is fixed now. As noted on the update. What does the trimpot control? Noise balance between the inputs. Nothing to be conserned about when using this circuit with a guitar or a bass. You won't notice any difference turning it with guitar/bass signal levels. I built a slightly modified version of this one(added the BYOC tone control). I'm getting an uneven compression, when I strum a chord and let it ring out, the volume seems to increase in waves. The controls all appear to be working, but the compression is not smooth. Would that indicate a bad CA3080? What else could cause this unevenness? I boxed it and swapped out Q5, the waviness seems to be gone now. I've been playing this pedal all night through the headphone jack of my practice amp and wow! Really quiet and the blend control is definitely the money! There were times I literally wasn't sure the pedal was still working, until I turned it off! 1. Did I mention the Blend control is the money? 3. TL072 sounded better than the NE5532, I did not notice any improvement in noise levels with the 5532. The TL072 sounded a bit warmer to me. 4. I added the BYOC 5 Knob Compressor tone control, highly recommended if/when using the neck humbucker. Country players will probably like it too. Finally, for everyone who has built the Keeley 4-knob and like it, you really ought to give this enhanced version a try. I'd like to give just the dry signal a boost so when the Compression control is at noon, both the dry and compressed signal levels are about the same at both extremes of the Ratio control. As it is now, the compressed signal is much louder than the dry signal with the Comp control at noon. Also, with the Ratio control full CCW and the Volume Control full up, the dry signal is just at unity, I'd like to give the dry signal a slight boost with those settings. 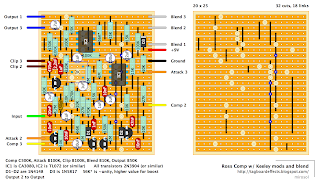 To increase the Dry gain, Would it be better to lower the value of the 100k resistor feeding pin 2 of IC2 or increase the value of the 130k resistor? I'm guessing the latter to keep the input impedance of the inverting op amp the same at 100k. That should suffice. 220K would nearly double the clean level. What's the chance of getting the schematic for this guy? I would like to create a pcb using the LM13700. I would really appreciate it. So glad I re-checked this, I didn't care for the compressor at all since it always had a bit of distortion, and volume drop, but after reversing the cap it's now my favorite comp! I just recently finished building this, and while debugging I was experimenting with different transistors (I have 2N3904 and 2N5088's on-hand), and found that removing Q3 made the circuit work as expected. Any reason why that may be? Or is it a "if it ain't broke" situation? Just finished this one up. Its acting semi strange. The blend knob mutes the circuit when it is fully ccw, and the transistor in the bottom left gets super hot. Any suggestions where to troubleshoot this one? Seems like your splitter part of the circuit isn't working right. Probe it to see where the splitted signal dies. From the first transistor's emitter there are two caps coming out. Other for the compressor circuit and the other for the split. The 470n taking the signal to IC2 is the split. Check the voltages on the that IC and see if there is signal present on pins 1 and 7. You should have ground on pin 4, supply voltage on pin 8 and all the rest should read around refence voltage (4,5V +/- 10%). That was a battle. I would fix one thing and then another problem would pop up. In the end, I think my problem came down to the 100 k resistor and the 130k. The signal was fine until it hit those. I think I found one or two places that I had missed when soldering and then there were some bridges that appeared out of nowhere that I fixed. There were just too many freaking parts to heep track of it all, haha. That is definitely the longest time Ive ever spent troubleshooting a pedal, but I didnt want to gove up on it cause it took so long. Its all working wonderfully now and sounds wonderful. I have a 100k resistor in there for a bit of a boost. and it has a great sparkle to it. thanks for the fast support! Good to hear you got it running! @Michael Oriente id really like to see that altered layout of your with the tone control. oh and nice comments and suggestions! Here it is, I used a LM13700 rather than the CA3080. Thanks for the hint although i just stocked some 3080. But i read smthng about the enclosure there on your link. Doesnt this fit in a 1590B? Just finished mine today on a 125B. Turns out the board's too large for 1590B. Such a nice effect thought!! Thanks so much, it's working like a charm!! !